William Charles Blue, Sr. was born on November 30, 1962 in Lumberton, NC to Betty Brown Blue and John D. Baker. He departed this earthly life on Wednesday, October 17, 2018 after a brief illness at Carolinas Medical Center in Charlotte, NC surrounded by his loving and dedicated wife and son who stuck by him to the end. William received his education in the public schools of Robeson County, NC graduating in the class of 1982. William was baptized int he name of the Lord Jesus at an early age, later becoming a member of the Highway Church of Christ in Rowland, NC. William was employed with Kayer-Roth , Converse, nineteen years at International Paper and Rempac Foam LLC. He was a person who did not talk too much if he did not know you, until the Philadelphia Eagles name came up. He was somewhat a jack-of-all trades. He could do a little bit of everything including very good with cars and computers. He was married to the love his life, Thelma McDaniel Blue for thirty-four years. Raised by Roosevelt Alford Sr. and Maggie Brown Alford who preceded him in death, his grandparents; and brother: Lorenzo Baker. 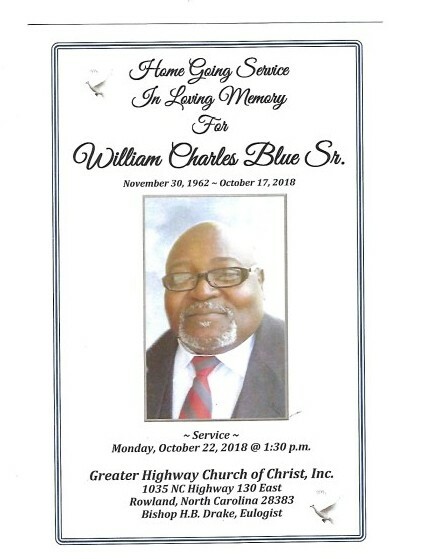 William leaves to cherish many fond memories ~ his loving wife and soulmate: Thelma Blue; his children: William Jr. "Chucky" of Durham,NC, Ryan (Arnetha) Blue; of Lumberton, NC, Len (Chanda) McCallum his mother: Betty Brown Blue; brothers: Malcolm Blue of Fairmont, NC, Angelo Brown of Rowland, NC, Alfred (Tamika) Blue of Philadelphia, PA; sisters: Wilmenia Blue of Pembroke, NC, Betty (Nay Nay) of Philadelphia, PA; Ann (Charles) Quick of Clio, SC; brothers: John (Annie) Baker of Maxton, NC, Mark (Connie) Baker of Rowland, NC, Tim (Stacy) Smith of Rowland, NC; other brothers and sisters; three sisters-n-law: Mattie McDaniel of Rowland, NC, Sallie Davis of Marion, SC, Clara McDaniel of Greensboro, NC; two uncles Roy Lee Brown of Tar Heel, NC, Timothy Alford of Waco, TX; two aunts: Julia Lovette of Rowland, NC, Maggie Love Shipman of Fairmont, NC; grandchildren: Xaxior Camrym James, Mariah Rose, Amaya; special step-mother: Mary Benjamin; special nieces: Sheila Berry, Cheryl Daniels, LaTonya Davis, Kimberly Davis, Angela Burton, Karen McDaniel, Teresa Taylor; special friends: John Shipman, Charles Ladson, Rev. & Mrs. Kenneth Tart, Chester Barnes, James Brown, Deacon Robert Blue, Deacon Curtis Murphy and other relatives and friends.